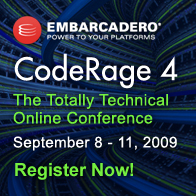 Not only can you watch the video and download the CodeRage 4 session on materials on Using Unicode and Other Encodings in your Programs, but below you can also find the chat transcripts below. (9/11/2009 9:15:45 AM) Jim_Ferguson: Jeroen, Have you been getting a bunch of internal errors when you get fancy with generics? (9/11/2009 9:15:53 AM) Borland: BTW, DavidI, excellent internet radio choice of KPIG. Very good Blues. (9/11/2009 9:39:14 AM) Jim_Ferguson: Strings are getting fatter on the back end. (9/11/2009 9:49:20 AM) Jim_Ferguson: TBYtes and pChar arent equivalt. TBytes is a dynamic array. Shouln’t be pByte instead of TBytes? (9/11/2009 9:53:05 AM) Jim_Ferguson: Sounds like Intel needs to build Unicode into the processor. There is a lot of out board thinking when it comes to characters now. (9/11/2009 9:58:26 AM) Borland: Thanks Joroen, this was packed with great information sources. (9/11/2009 10:00:47 AM) Erwin_Mouthaan: Bedankt Jeroen. Leuke presentatie! (9/11/2009 10:01:04 AM) jthurman: Jeroen is a marching band guy? (9/11/2009 10:01:05 AM) M_L: Thanks! (9/11/2009 10:01:22 AM) Giel: Bedankt Jeroen! (9/11/2009 10:01:40 AM) jthurman: Jeroen: I teach high school marching band in the USA. We should talk sometime. (9/11/2009 10:02:45 AM) Robert_Evans: Thanks Jeroen. Great stuff! This entry was posted on 2009/09/11 at 19:26	and is filed under .NET, C#, CommandLine, Delphi, Development, Encoding, ISO-8859, ISO8859, Prism, Software Development, Unicode, UTF-8, UTF8, XML, XML/XSD, XSD. You can follow any responses to this entry through the RSS 2.0 feed. You can leave a response, or trackback from your own site.